Friends of Hill Public Library Marks 25 Years of Tradition! A Child’s Christmas in Wales by Dylan Thomas, a cherished holiday classic, is full of colorful aunts and uncles, playmates and adventures, all set in a snowy December long ago and far away. Pontine Theatre’s co-directors, Greg Gathers and Marguerite Mathews, bring Thomas’ images to life with poetic movement and charming bits of stage magic. The performance also includes a lively staging of Clement Moore’s A Visit From St. Nicholas. Perhaps we’ll all have a chance to give our wish lists to Santa! 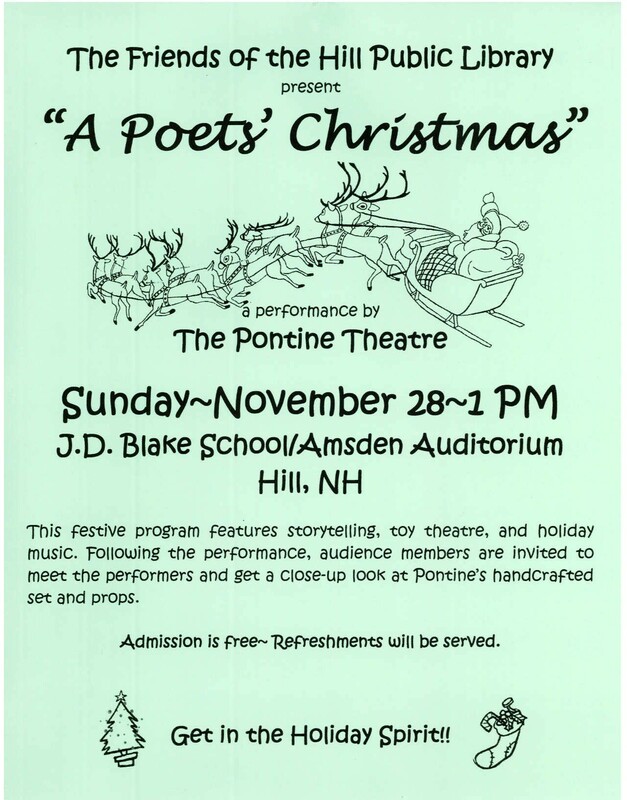 This fun and festive program will be held on Sunday, November 28, 1 PM, at the JD Blake School Auditorium, 32 Crescent St., Hill, NH. Admission is free. F ollowing the performance, audience members are invited to enjoy refreshments and get a close-up look at Pontine’s handcrafted set and props. Don’t forget to bring a camera. Pontine’s 2010 Holiday Tour is made possible in part by a grant from the Jack & Dorothy Byrne Foundation. We’ll be drawing the winners of our Holiday Raffle on this afternoon, too! Good luck and thanks for your support. 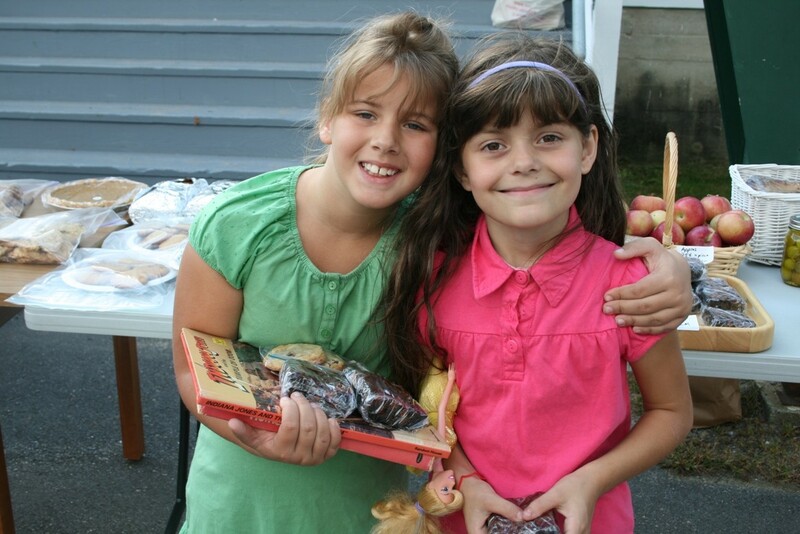 The Library’s annual Fall Festival was held on Saturday, September 25. It was, in a word, awesome. The weather was amazing and the crowd, enthusiastic. There were literally thousands of great books available for browsing. Festival-goers found it hard to resist our impressive array of delicious homemade goodies, which included fantastic items such as pumpkin pie, apple streudel, and baked beans. Several local crafters were present, as was Linda Dumond, a certified Bob Ross Instructor. 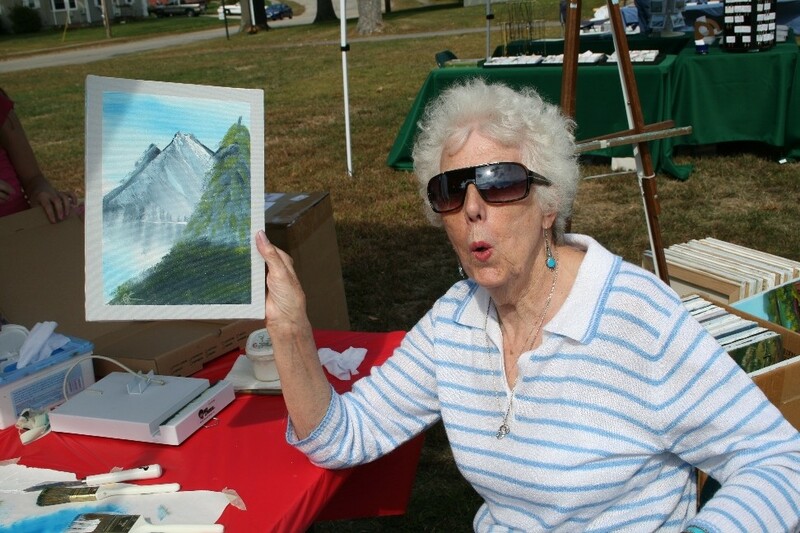 For a reasonable fee, patrons were able to take home their own completed paintings after a mini-class led by Linda. The event was not only a lot of fun, but very profitable as well. Much to our surprise, we raised over $800 for the library! This fundraiser would not have been a success without the assistance of many. 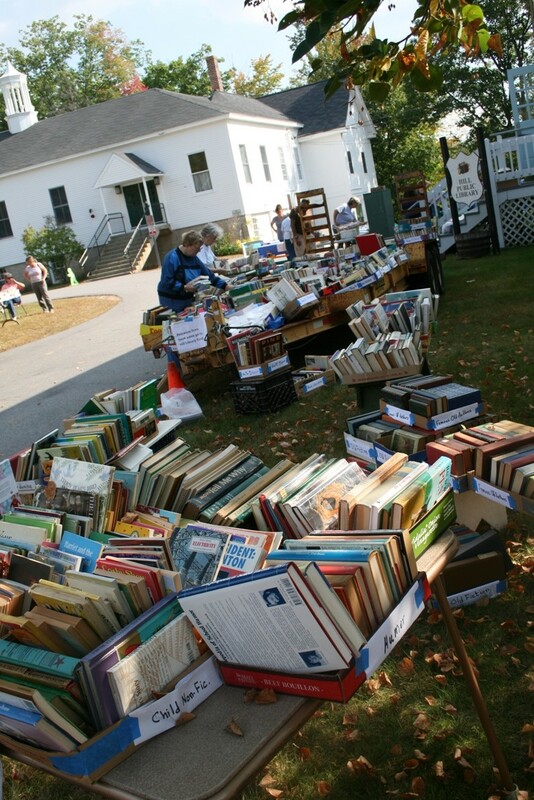 We’d like to thank the Friends of the Hill Public Library, Martha Jordan, Norma Kane, Steve Hunter, Steve & Zack Plante, Bob & Sandy Lundfholm, and Steve Taylor for their time and effort in organizing the book sale. Many thanks as well to Linda & Chuck Denningham and our team of bakers who helped make the event a sweet success! A special “thank you” goes to Sarah Gabert for making and distributing Festival posters. To all those who attended the Fall Festival, we give our heartfelt thanks for your overwhelming support of the Hill Public Library! My own happy little mountain! Stop by the library and take a chance at winning your choice of prizes we’ll be giving away during our Holiday Raffle. These items are perfect for gift-giving or treat yourself this season! Tickets are available at the library for $1 or six for $5, and winners will be drawn on November 28, following the Pontine Theatre holiday program. For more info, please call 934-9712. All proceeds to benefit HPL. Thanks for your support!